Alouette - thanoscardgamess jimdo page! 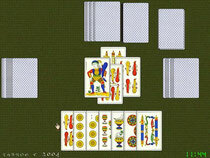 Aluette is a card game played in South-Western France using a latin-suited card deck. This is an easy trick taking game for 2 or 4 players in partnerships where there is no trump suit and no obligation to follow suit. The winner of a trick, is the person who plays the highest ranking card. In the case of a tie, the trick is set aside, and the winner of the next trick takes both tricks. The object of the standard game is to get the most tricks. This game becomes much more interesting by aiming alternatively to get the three of Diamonds, or to avoid getting the Jack of Spades, which can be difficult tasks considering that not all cards are dealt to the players.